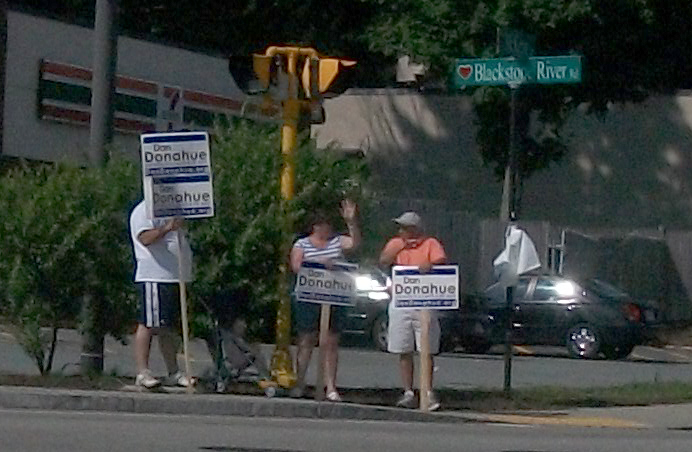 Hordes of panhandlers descended on Quinsigamond Village yesterday. I would really appreciate folks sharing this! Our friend Eric Kuczarski (of Movies on the Common fame) and his family will be holding a kickball tournament in honor of their daughter (and sister) Sophia on Saturday, August 9, beginning at 9am. Sophia Kuczarski had a spirit as bright as the sun, and lost her fierce battle with Acute Lymphoblastic Leukemia at the young age of 4. In her honor, the Sophia’s Sunshine FUNd provides Worcester County families support while facing the challenges of having a seriously ill child. Kickin’ It for Sophia’s Sunshine FUNd will be a great day of Kickball, fun, food, and great memories – all for a great cause! So grab your family, friends, and neighbors to join us for an awesome event! The kid’s Kickball games will be played from 12-2pm with lots of other fun activites happening throughout the day. Teams for kickball can be formed with no restrictions other than the maximum limit of 15 participants, but it is encouraged to create co-ed teams if possible. Please feel free to contact us with any questions. The adult tournament will utilize a double elimination format that will begin at 9am and break for lunch from 12-1:30pm. All tournament games will played according to the WAKA tournament rules that can be found here: Kickball Rules. Basically, you will need a minimum of 4 men and 4 women to constitute a team, with a maximum of 11 players on the field at any time, and everyone in the lineup kicks regardless of playing the field. If you have any questions, there are many FAQs online if you do a quick search, but please do not hesitate to contact us with any questions. Whither the Need for Speed? In Worcester, the spectre of the strong mayor appears every couple of years. Whenever an issue bubbles up and residents aren’t pleased with the way the city manager handled it, whenever another municipality succeeds, our collective insecurity kicks in, and our inadequacies — real or imagined — give new life to the dream that will never die. That dream is, of course, different things to different people, but it always takes the shape of a strong mayor. To some, a strong mayor means increased accountability to the electorate, a louder voice to our legislators on the state and federal level, or a faster track to economic development. To others, it’s simply a way to further consolidate power within a very small elite. I don’t want to minimize the feelings of those who think strong mayor is right for Worcester, or who want a further conversation. For many years, I felt that the lack of a strong mayor is what was holding Worcester back from achieving everything it could. And I always welcome further community conversations. But — being Worcester — there is a tendency to go from 0 to 60 in any community discussion. We can’t have a discussion about whether we want a slots parlor — we jump straight to mitigation! While we’re having hearings about a city manager, we’d prefer comments in one of two categories: that the current incumbent is perfect, or that a strong mayor would be even better. Identify the main issues residents have with city government. This could be a lack of diversity, a lack of public engagement, a feeling of not having a voice — and lots of other things I’ve never even thought of. Identify what’s currently working in city government. There’s got to be something right, and we shouldn’t throw the baby out with the bathwater. Can the problems be rectified within the existing system? Would the administration or elected officials be willing to focus on the major concerns that come out of the meetings? If not, would a different slate of candidates bring about the changes needed? Finally — if the problems can’t be rectified within the existing system, discuss better systems to accomplish goals. This would be a journey of months — if not years — and would require a lot more community engagement than we’ve seen in some time. You can’t get to a solution without first identifying the problem(s). For too long ,we have looked at the strong mayor as a one-size-fits-all solution to whatever aspect of Worcester’s government we’re dissatisfied with. And the powers that be are eating it up. If we actually had a long discussion about what’s wrong with this city, at some point we’d talk about who is actually running things — or, to the point, who wants to be running things. Folks like Gerry D’Amico, and Mike Angelini, and Kevin O’Sullivan, and Tim Murray — and the associated wannabes like Dennis Irish and Phil Palmieri — don’t actually want people to have a real conversation. They would like to harness our general dissatisfaction into first derailing any possibility we might have at attracting a decent city manager, and then getting their candidate elected as strong mayor. 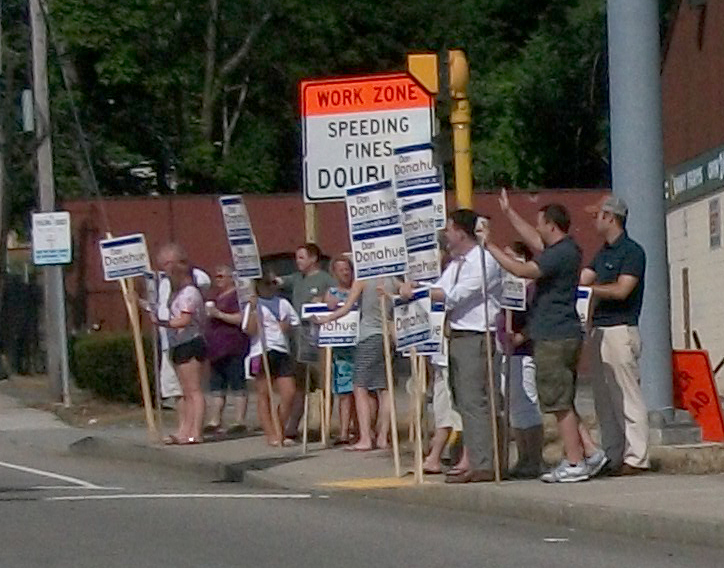 I don’t want to disparage the work of the Worcester Community-Labor Coalition. I’m really impressed with the turnout at tonight’s City Council meeting. But I disagree with asking the City Council to conduct any kind of hearings about changing the form of government. They have shown that they have no interest in listening when residents say what they want in a city manager, and have proved utterly incompetent at getting a decent job posting written. I have no confidence the City Council could have a satisfactory community discussion about what color flowers should be planted outside City Hall, never mind changing our form of government. I have no confidence that those who continue to run things behind the scenes will just step back and let the people have their way. They are only interested in having enough voter turnout to get the charter changed. Then it would serve their interests to have things return to the status quo of 11% voter turnout. If this conversation will go forward — and all indications are that it will — it would behoove us to instead have the meetings led by a relatively unconnected group of citizens, preferably non-politicians. 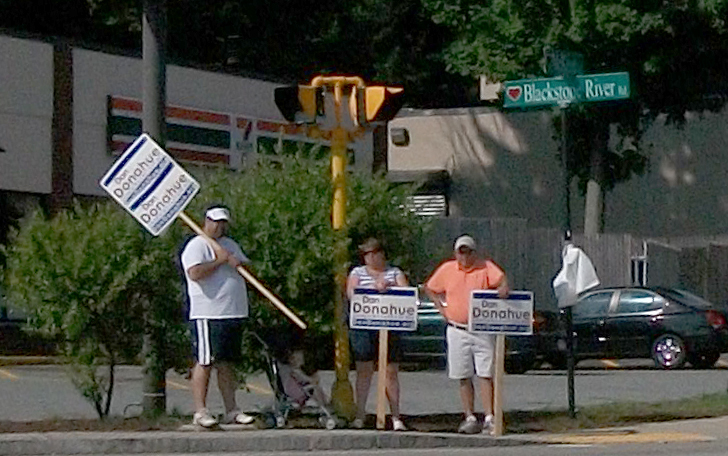 Since we know from the WCLC’s polling that residents are equally split between a city manager and a strong mayor form of government, an impartial name like “Worcester Government Reform Commission” would leave room for any number of possible conclusions the committee would come to, without unnecessarily narrowing the conversation. There are a lot of thoughtful, intelligent people in this city, from all walks of life, who have different experiences of city government, and who have different ideas on how to improve it. For too long we have allowed a tiny clique to stunt conversation and to drive their own agenda. It would be a shame if we allowed that to happen again. I do not want to be writing a blog post next year that says, once again, that it would be great to have a head librarian who lasts more than a year and a half. At this point, I think Worcester might settle for a head librarian that deigns to grace us with a presence of a year and a half. Sue Swanson and I want to bring you up to date on the Coes Pond area initiatives and what we all can and must do to energize and accelerate everyone’s efforts. 1) Please join us on Friday, August 1 when Ed McKeon and others will lead us on an interesting, informative and eye-opening walk around Coes Pond. Folks will meet at the new park’s parking lot (the former Coes Knife property) at 5:00 PM. The walk will be about 1 mile around and, of course, a mile back. Because the owner of the former Big D/Price Chopper property has been towing cars at $140/tow, DO NOT ever park there. 2) We have decided that the best way to make the most progress on the various Coes area initiatives, is to form three main committees, each of which will be charged with its own set of responsibilities. Of course, there will be some overlap among committees. Please review the brief descriptions of the committees and choose which one(s) you’d like to serve on. Then let Sue and I know what committee(s) you are interested in serving on. We’ll assign temporary chairs to each committee (later they’ll choose their own). The initial meeting date, time and location of each committee will be determined by those chairs. The three committees will function independently of each other. We’ll hold a large joint meeting in the fall at which committee chairs and members will report on their goals and progress. Pond Committee – This committee will deal with the Mill St. Beach (including parking, bathhouse, dredging, signage, swimming, kayaking, etc.) and all water quality issues associated with Coes and neighboring water bodies, dam. etc. Publicity and PR – This committee will deal with all publicity, public relations, education, fundraising, politicking and lobbying at the local, state and federal levels. One of its goals will be to bring this beach back to its former glory for the summer of 2015. The City Manager and I met at the Mill St. Beach two weeks ago and the lifeguards on duty told us how much positive difference it made to the beach goers after the Parks Dept. had cut quite a bit of brush and growth away from the water line where folks enter the water. So much needs to be done but, working together, we can do it. With our successful efforts, this beach and bathhouse once again will be a wonderful place for families to go next year. Please let us know whether you plan to attend the August 1 walk and/or join a committee. And please forward this email to others who might be interested. 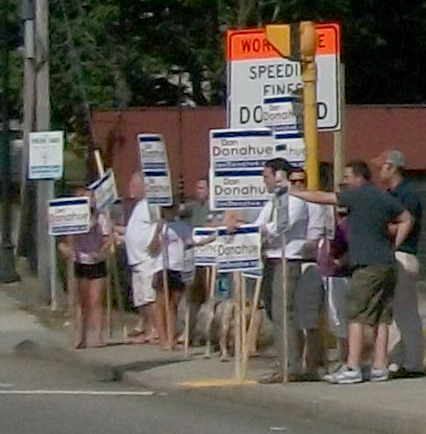 The most recent episode of 508 was devoted, to a large part, to branding of the city, whether it be through Wayfinding or through Councilor Toomey’s request on tonight’s City Council agenda for the law department to determine whether or not regular folks have the right to use something similar to the city seal. This blog has used a variation of the city seal for some time. 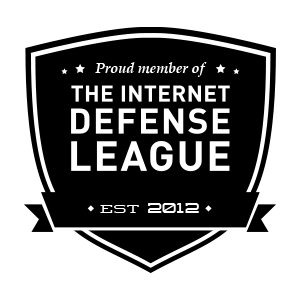 I asked my husband to design a satirical version of the seal that used barbed wire, because I love this city and I love its history. The city government has, for many years, been moving away from the seal and its beautiful strawberry-shaped heart, towards a multicolored square. That square is on the bottom of every City Council agenda; it features prominently in every brochure, website, or poster I see about cultural events; it’s featured much more often in the original Wayfinding presentation than does the actual seal of the city. I believe the intention of the multicolored square is for branding of cultural activities, especially ones that are not just sponsored by city government. However, the square — not the city seal — is what is featured in the top corner of the official city website. The favicon for the official city website is the square, not the seal. Over the past few years, the city government has done its best to downplay the seal and prominently feature the square. But many residents — myself included — love the seal and associate it with the best parts of this city. The city government has done its best to distance itself from that seal, but now Councilor Toomey doesn’t want anyone else using what is the design equivalent of abandonware. If you don’t want it, we’ll take it. Either copyright and actually use the city seal — or let the people who love this city use it. Worcester Regional Research Bureau‘s Wait Wait…Don’t Tell Me It’s Worcester at the Pop Up on Franklin Street at 6:30pm. Movies on the Common (this month: The Goonies) thereafter.